Rappelling was once considered a prerequisite skill for any climber navigating 5th class terrain. It was a mainstay of introductory texts, climbing classes, and novice climbers were often taught to rappel before they ever climbed their first pitch. Much of that has changed, and large numbers of climbers enjoy all kinds of outings where rappelling is both unnecessary and perhaps unwise. Many toprope venues do not require rappelling during setup, many sport climbing venues are equipped to quickly clean anchors by lowering, bouldering usually does not require any form of technical ropework (much less rappelling), and most modern climbing gyms flatly disallow rappelling. As a result, rappelling is something that many climbers understand conceptually (having lowered each other) but fewer have actually experienced. As a result, when rappelling accidents happen to beginners we often discover that the contexts of rappelling were not perfectly understood, the fundamental physics of rappelling were confused, and the variability of the rigging was understated or oversimplified by mentors and instructional materials. A generation ago, every climber learned to rappel. Early rappel techniques, like the Dulfersitz, helped climbers learn the relationship between the body and rope friction. These techniques still work, but they don't provide many options for backups or added security. By comparison, experienced climbers have often rappelled hundreds or thousands of times, but an unfortunate number of us also seem to be randomly involved in rappelling accidents. In these cases, preventative practices like knotted rope ends, using backups, and a system of careful double-checks were often overlooked or ignored, even though the value of these techniques is undisputed. In this article, we hope to create a resource for novice climbers to understand what rappelling is, the contexts in which it happens most commonly, and a set of principles that should govern the rigging. We also hope to address any reader that may be well into their rappelling career. Perhaps some will find reasons to adopt practices that they have historically ignored, or revise the practices they are currently committed to using regularly. In some cases, this article may simply validate what a reader is already doing, but in that case we hope it might also give them a vernacular for communicating with their friends, students, and mentees. To put it most simply, rappelling is just lowering your own mass down a climbing rope. In belaying, the belayer remains stationary and the rope moves. In rappelling, the rope remains stationary, there is no belayer, and the rappeller is the thing that is moving. Once a climber has rappelled a few times, these distinctions seem painfully obvious. But, as thousands of climbing instructors will attest, until a person has experienced the fundamental difference between being lowered and rappelling, it’s not obvious at all. A rappeller has independence, agency, and control in a way that a person being lowered does not. That can be advantageous, but it also means that rappellers sometimes lose the advantages and redundancy of team work. There are two main variations to rappelling mechanics: fixed-line rappelling and counterweight rappelling. In fixed line rappelling, a climbing rope is connected to an anchor, the rope remains stationary, and the rappeller can rappel all the way down to the other end of the rope. In counterweight rappelling, a climbing rope is not fixed. Instead the rope runs freely through a rappel station, set of carabiners, or around an object. In this arrangement, a rappeller must capture both strands of rope within the rappel in order to counterweight around the rappel anchor point, and the rope can be retrieved from below. In counterweight rappelling, a rope runs freely through a rappel fixture. As a result, a rappel device must capture both strands of the rappel rope. The rappeller effectively counterweights themselves. In fixed line rappelling, the rappel rope is affixed to an anchor, so the rappeller does not need to effect a counterweight. The rappeller can rappel a single strand of rope. Climbers rappel for two main reasons, in two primary contexts: single pitch rappelling and multistage rappelling. Both options are slightly different, and a climber learns to adapt the rigging, the device selection, and the anchoring accordingly. Multistage rappelling happens when climbers ascend a multipitch climb and descend the feature through a sequence of rappels. They climb a big wall, up up up, in sections, and then they rappel, down down down, in sections. Single pitch rappelling. Climbers also occasionally rappel when they clean anchors in a single pitch setting. Sometimes, local custom or policy require climbers to rappel when they clean. Sometimes, lowering is not an option. Sometimes, rappelling is needed in emergencies. The first step in avoiding any climbing incidents is good prior planning. Get all the information you can from the guidebooks. It is also a good idea to take a copy of a route topo—even if you have done the route before. And consider looking at blogs and talking with friends or acquaintances for information. Equipment inspection before each season—and before each climb—is always important. Is it time to retire your ropes, slings, or harness? Look closely at all the gear to see if there are any obvious wear and tear issues and consult the manufacturers for recommendations. Double-check any critical system carefully before committing to it. Look through and inspect all critical links, carabiners, the rope’s integrity, the harness’ key points (buckles, belay loops, and connection points). It’s always helpful to have a partner nearby so that climbers can double check each other. — Rob Hess, UIAGM/IFMGA. From Accidents in North American Mountaineering 2012. You should be secure during the setup because rappels are often rigged in proximity to cliff’s edges and precipices, and even careful and experienced climbers are endangered by that kind of exposure. You should use appropriate backups because a variety of factors make it likely that a rappeller will lose control of the rappel. You should manage the ends of the rope because we often rappel in the dark, when tired, with unfamiliar ropes and in unfamiliar terrain, and since we often rappel rapidly, the ends of the rope can present a unique hazard. Avoid Entanglements. Rappelling involves a lot of rope that must be carefully managed and rappel devices that notoriously entrap hair, hoody-strings, straps, and clothing, the last principle asks us to manage the rope and manage ourselves to avoid entanglements. There are lots of ways to be secure during setup. Generally, the options fork into two initial categories: technical and non-technical. Non-technical security does not involve anchors or tethers or carabiners. It’s simply staying away from a cliff’s edge or staying seated when setups are awkwardly close to a cliff’s edge. Technical security uses some sort of tether, sling, PAS, or the climbing rope to connect the climber to an anchor during setup. The context of the rappelling usually inspires a wide range of variations among the tethering methods. With their back turned towards a precipitous cliff's edge and their attention focused on setup tasks, these climbers are using technical security (a tether and locking carabiner) to stay secured during setup. — Rob Hess, UIAGM/IFMGA. Accidents in North American Mountaineering 2012. A rappel backup effectively provides a backup for the rappeller’s brake hand. If the rappeller were to release their grip of the brake strand for any reason (losing control, rockfall, medical emergency) the backup would effectively hold the rope instead of the rappeller’s brake hand. There are three common variations: a friction hitch backup, a firefighter’s belay, or the use of an Assisted Braking Device. A Friction Hitch Backup can be quickly paired with any tube style rappel device, but the setup has to be precisely configured. If a backup doesn't work when you need it to, it constitutes little more than wasted time, material, and effort. Common examples include friction hitch backups that are poorly dressed, iced or frozen, or they don’t assert enough friction to grip the brake strands with adequate braking power. Also, if a friction hitch backup is too long, it will push up against a rappel device, pushing the hitch along instead of allowing it to grip the brake strands. It’s important to get the lengths just right so that the backup engages. On steeper rappels, an inverted rappeller can easily bring the friction hitch into dangerous proximity to the rappel device. Precise rigging is vital to an effective rappel backup. It's not enough to apply a friction hitch; the distances and positions of all the pieces have to be just right. When we don't pay attention to the details, when the rigging is imprecise, our backups are ineffective. This climber has wasted a lot of time and energy rigging a backup that won't work. Since the rigging of friction hitch backups has to be so precise, many rappellers prefer to extend their rappel devices away from their harnesses. In this configuration, the friction hitch backup can be connected directly to the belay loop. In general, extensions allow for a greater margin of error in the rigging of rappels and their backups, which is advantageous. An extension built with a double length nylon sling positions a rappel device far enough from a belay loop that almost any friction hitch backup will be effective. An autoblock friction hitch is a great option when tying a rappel backup. A small loop of 5mm nylon can be quickly deployed for the task. ...and the autoblock is completed by rejoining the nylon loop with the locking carabiner. There are eternal debates about the type and style of extension used to separate a rappel device from the harness. Suffice it to say, there are many adequate options. As long as the option is adequately strong and secure, without compromising overall efficiency, it's probably a good one. Some of the most common alternatives include a Personal Anchoring System (PAS) or quickdraw with locking carabiners. For multipitch rappelling, an extension that has a modular leg can be used to both extend the rappel and clip into anchors during rappel transitions. An offset extension is great for multistage descents. Firefighter’s Belays are effective backups too, but they have to be executed correctly. To provide a firefighter’s belay, the belayer should be attentive, with eyes on the rappeller and hands on the brake strand(s) of the rope. If the rappeller were to lose control of the rappel, the attentive belayer would pull down assertively on the brake strand(s) in order to effect enough braking force to halt the rappeller’s descent. Much like a poorly rigged friction hitch backup, a firefighter’s belay that is inattentive, loose, or off the fall line will likely be ineffective. When this climber offers a firefighter's belay, she means it. She's attentive and ready to halt the rappeller at any moment. When rappellers lose control it happens quickly and unexpectedly, but a quick and firm tug on the brake strands will bring the rappeller to a halt. Managing the ends of the climbing rope is often a vital technique to keep rappellers from rapping off the end of the rope. Commonly, the ends of the rope are either conjoined or bulky stopper knots are tied, such that the knot that would ram into a friction hitch or rappel device, reliably arresting the rappel. A pair of bulky stopper knots are among the easiest ways to manage the ends of the rope. Conjoining the rope ends and carrying them to the ground has the added advantage of managing the ends of the rope while also avoiding tossing ropes down the cliff. It’s important to keep anything from getting snagged in a rappel tool, and it’s also important to keep one’s ropes organized and moving fluidly. Entanglements of hair, clothing, or the rope can create serious problems while rappelling, especially in adverse conditions. Tossing ropes. It is rarely necessary or expedient to throw ropes down a cliff. Often, the tails of rope can be gently lowered to the ground, or a bight of rope can be lowered and the tails carried to the ground by the rappeller. It’s also likely that tossed ropes will land on other climbers, in places that are difficult to retrieve (trees or cracks), or places that are awkwardly gross (mud, poop, carrion, etc). A rappeller can avoid entanglements by avoiding tossing ropes. It is a worthwhile thought experiment to imagine how climbers create margins of error, how we use backups, and how/when we selectively (and hopefully carefully) disregard those techniques. Typically, a climber navigating 5th class terrain uses a rope system to mitigate the risk of ground or ledge impact, but sometimes we intentionally neglect to place enough protection to effectuate the rope system we’re tied to. Those are enormously risky behaviors, but we tend to engage in them quite readily when we perceive there to be a low probability of incident, like when the climbing is easy or unremarkable. Similarly, a small portion of climbers free-solo in 5th class terrain, and their calculation is identical: they perceive there to be a low probability of incident, and they therefore eschew a rope system altogether. The indisputable reality is that good climbers fall off of easy terrain every year. Experienced rappellers lose control, rap off the ends of rope, or incorrectly rig their rappels. As a species, humans don’t always reconcile their rational/analytical response to risk with their intuitive/emotional response. As a result, best practices like using backups, managing the ropes ends, staying secure during setups, and careful double checks are often characterized as overly conservative, burdensome, and slow. Similarly, eschewing these practices altogether, which is actually tantamount to free-soloing in a demonstrable ways, can be characterized as a matter of preference, style, or status. Am I secure while I setup the rappel? Am I using appropriate backups? Am I managing the ends of the rope? Anchoring is a subject that is often debated and analyzed, and yet much of what is being proselytized or disparaged does not adhere to fundamental principles of physics, human factors psychology, or a working understanding of rock quality and material science. It is not entirely mysterious how American climbers have gotten to this point, but it is certainly mysterious that so many of us insist upon remaining in a scientific and practical abyss. Anchoring has evolved. It continues to evolve. If we want to continue that evolution, it’s valuable to explore the relationship between the past, the present, and the future. Today, anchoring is considered to be a precise, quantifiable art, but the science many climbers use to evaluate and quantify an anchor is dubious. Trusted and lauded concepts like equalization and no extension can be proven to be over-valued and/or inconsistently applied, which leaves us on uncertain footing. If what we know about anchoring is questionable, what can we rely on? What does it mean when we say that anchors should be strong, secure, and simple? The earliest written instructions for anchoring all emphasized the value of finding a reliable and unquestionable protection point. Rock horns, well-placed ironmongery, threaded holes and chockstones, and substantial vegetation all served to give a belayer enough security that his or her body belay would not be displaced by sudden dynamic loads. Importantly, climbers did not spend much time trying to quantify or calculate the properties of an anchor because the anchor was just one part of a system that depended largely on a gigantic human component: the belayer. Anchoring, as a skill set, was inextricable from the belay that relied on it. This image, taken from The Climber's Bible by Robin Shaw circa 1983, typifies the instruction of anchoring in a previous era. The belayer uses his stance to guard the anchor. Modern belay anchoring is much different. A belayer is not guarding the anchor with her own body weight or using the anchor simply to augment her stance. Instead, the anchor is expected to support a falling, resting, or lowering climber entirely, based on its own integrity and load-bearing capabilities. As a result, the anchor and its focal masterpoint have become the foundation of most technical systems for climbing rock and ice. For example, when top-roping, the anchor is usually asked to hold the belayer and the climber in a counterweight arrangement. In direct belays, the anchor and its masterpoint are asked to sustain the weight of the seconding climber and any loads created to assist the seconding climber. In multi-pitch climbing, the anchor is asked to belay the second and then sustain the upward pull of the leader. A modern belayer does not just use an anchor as a backup. As we can see, this belayer is fully committed to the load-bearing properties of the anchor. It holds his bodyweight, and the bodyweight of his second. Whether we’re top-roping or multi-pitch climbing, whether we’re in the gym or at the crag, whether we’re building anchors with bolts or trad gear, we are increasingly dependent completely on anchors. And building them has become a foundational skill in technical climbing. Belaying one or two seconds directly off the anchor is called a Direct Belay. If an anchor is reliable, direct belays are more versatile and more manageable than alternative configurations. Modern anchors are configured to secure belayers no matter who they are belaying. They might be belaying a second; they might be belaying a leader. A key aspect of modern anchors has been the development of acronyms used to teach and evaluate them. These acronyms are not without merit. They helped a generation of climbers inaugurate a new era in anchoring. Anchor builders used such mnemonics like a checklist of key principles, and the anchors they created served climb after climb reliably and predictably. Here’s how a typical anchoring scenario might unfold: The anchor builder, armed with a fundamental principle like SERENE, arrives at a pair of bolts. She begins to work through her acronym. She assesses the bolts and feels they are both strong. Knowing she’ll need to build a redundant and equalized anchor, she selects a 7mm nylon cordelette as her attachment material. She doubles up the cord, clips one side to each bolt, targets the anticipated load, and then ties an overhand knot in such manner that creates two isolated legs and a masterpoint. She clips into the master- point with a locking carabiner and her clove-hitched climbing rope. Good bolts. 25kN each, combining to 50kN at the masterpoint. Solid: Check. One cordellette, one knot, 30 seconds to build. Efficient: Check. If any single part of this anchor up to the masterpoint were to fail, there are backups. Redundant: Check. When weighted, both legs of the anchor are tight. Equalized: Check. If anything were to break, the masterpoint wouldn’t extend. No Extension: Check. She’s built a SERENE anchor. Anchoring acronyms help us ask basic questions about an anchor's qualities, but an absolute loyalty to concepts like redundancy and equalization can be misleading. Millions of anchors have been constructed in approximately this fashion without incident or mishap, so it would be hasty to suggest that anchoring acronyms do not have value. However, climbers who also happen to be engineers, physicists, or just generally scientific-minded are quick to point out a fact that continues to elude a large number of climbers, climbing instructors, and authors of climbing books: Some of the qualities espoused in these beloved acronyms are not actually achieved in nature, neither practically, mathematically, nor experimentally. Modern climbers have largely shifted from relying on the belayer’s weight as a key part of the system to relying wholly on the qualities of an anchor, and yet many of the qualities we aspire to achieve are based on nuanced falsehoods. As anchoring situations grow more complex, a climber attempting to tick every box on such an anchor checklist can waste significant time trying to reach unattainable goals. Worse, the climber may be lulled into a false sense of security. The time has come, as a climbing culture, that we confront the modern science to ensure that it aligns with modern anchors. That might mean that many of our beloved acronyms are best suited to teaching novices, instead of remaining our only checklist as we grow in the sport. But it also might allow our understanding to evolve as rapidly as our sport does. Anchoring acronyms still have value when climbers are first learning to build anchors. Anchors never really equalize. That is to say, they never manage to equally distribute the total load of the climbing team equally to all the components in the anchor, unless there is only one component. Yet, much false confidence and unnecessary time is contributed to achieving the elusive goal of equalization. Even the theoretical load distribution of many anchors is not "equal." This anchor builder intentionally rigged to distribute more load to big pieces and less load to small pieces. As a result, anchors that funnel into a masterpoint do not succeed, as intended, in aggregating the strength of the things they are attached to. A strong anchor thus is only as strong as the component that is holding most of the weight most of the time. With an appreciation for this reality, many climbers gravitate toward “self-equalizing” anchoring systems. Magic X and quad configurations have become popular, but their ability to self-adjust to variable load direction is not perfect. The climber imagines that the shifting and sliding masterpoint allows equalization to happen, but in truth it only sort of happens...eventually...if the material doesn’t create too much friction. In the meantime, as the masterpoint slides along, the bulk of the load spikes from one component to the next. What’s more, self-adjusting anchors all create opportunities for extension, despite the familiar anchoring acronyms’ insistence upon no extension. Anchor builders are forced to qualify that rule, applying load-limiting knots that limit or minimize extension. For years, we’ve been loyal to principles that are scientifically inaccurate, encourage us to miscalculate the strength of our anchor, and force us to make convenient exceptions to principles like “no extension.” And while these acronyms enabled a generation of anchor builders to solve basic anchoring problems, in more complex scenarios these principles can easily become a liability. We use our equipment incorrectly. It doesn’t matter if the manufactured strength of a cam exceeds any load we could ever apply to it if we place the cam incorrectly. Similarly, a rope’s strength is irrelevant if we tie knots incorrectly. Our equipment has been damaged. Chemicals or heat or trauma can cause imperceptible weaknesses in our equipment. We have to take good care of our gear. The rock is not as good as we think it is. Evaluation of rock, ice, vegetation, and other anchoring media is a critical skill, on a micro and macro level. If there are hidden weaknesses, an anchor will expose them. We just make mistakes sometimes. We can all appreciate that fatigue, haste, distraction, and peer pressure lead us to do uncharacteristic and dangerous things. It’s part of being human. Acts of nature happen. There is such a thing as a no-win scenario in anchoring. We could do everything right and the mountain we’re climbing could collapse around us. That’s a bad day. All this causality is actually good news. The list above is ordered according to factors that we have the most power and knowledge to prevent. We can learn to use our equipment correctly. We can take good care of our gear. We can evaluate the rock more carefully and more skeptically. We can learn to prevent most anchor failures by being careful and knowledgeable. Such knowledge and care are part of what is keeping us safe out there, and if there are gaps in our knowledge, addressing the gap is vital. Instead of clinging to ideas like equalization and no extension, we can anticipate lurking dangers in our knowledge deficit. The following scenarios could be caused by a simplistic or inaccurate understanding of anchoring. Small-component anchors. A devout loyalty to simple acronyms can have dangerous consequences when all the components in an anchor are smaller and weaker. If, for ex- ample, an anchor builder takes three small cams with 6kN of holding power each and imagines that an equalized masterpoint offers 18kN of combined strength, all the requirements of a SRENE anchor could be met. However, since equalization never really occurs, one of those pieces will be holding most of the weight most of the time. In that case, a single load that exceeds 6kN could sequen- tially rip every piece out of the rock, resulting in a catastrophic failure. Lesson Learned: Avoid building anchors where no single component is strong enough to hold any potential load the climbing team could create. Anchor builders start to imagine that they can aggregate the load-bearing properties of each component, which might not be true at all. One tiny piece is probably holding most of the weight most of the time, with only other tiny pieces as backups. Adjustable anchors. Anchors that self-adjust, like quad and sliding X configurations, do not eliminate extension. Mathematical data suggest the potential shock loads created by extension (even limited and minimized extensions) can be severe. If an anchor is constructed with only two pieces of equipment, like two 10kN cams, all the requirements of a SRENE anchor could be met. Yet a load large enough to make a single piece fail could catastrophically shock-load the second piece as well. Lesson Learned: If you’re using self-adjusting systems, make sure ALL the components can survive the expected loads AND potential shock loads. Bomber pieces are required. Don't forget, adjustable systems do not necessarily create a perfect load distribution. Add a human factor or a large load and the resulting shock-loads can be more consequential than anchor-builders realize. Stacked quads or Xs. Just as the self-adjusting properties of a single sliding X or quad configuration are imperfect, stacking these configurations multiplies those imperfections. The failure of a single piece proceeds to shock-load all the remaining pieces. Lesson Learned: When stacking adjustable systems, make sure the components can handle expected loads AND potential shock loads. All these potential extensions are also potential shock-loads. Can all the placements handle all those potential loads? The direction of load applied to an anchor changes. The belayer could lean on an anchor in one direction, the belay might tug the anchor in a different direction, and two climbers at an anchor might fidget and tug and lean in lots of directions. Belay transitions on multi-pitch climbs can offer dramatic direction of load changes too. Typically, the anchor is rigged to belay a second climber, and then the same anchor is used for the lead belayer. The two loads could be completely different. All these different changes in the direction of load will shift the entire load onto a single component. The components available for anchoring might be vastly dissimilar. Some cams are rated to hold over 14kN, while the smallest cams may be rated to hold less than 6kN. Even if equalization were achievable in an anchor, why would anyone expect these two cams to do equal work? They are not equally valuable components. When anchoring components have vastly dissimilar load-bearing properties, the rigging will have to be more complicated. The concept of equalization presumes that each component is equally valuable. But, even perfect placements in perfect rock do not alway have equal load bearing properties, as pictured here. Anchor builders might instead make gestures to prioritize the strongest pieces, to equitably distribute load, rather than equalize. A climber often has to construct an anchor with limited resources. The values and principles of anchoring do not change, but building a fundamentally sound anchor with limited resources is very challenging. It often requires some innovative and artistic problem-solving, hence the complexity. How often has this happened to you? You've got to build an anchor with the gear you have left. It can get complicated when the resources are limited. It should also be mentioned that the circumstances mentioned above might coincide and overlap. Since direct belays rely on fundamentally sound anchors, they may not be an option in some of these extreme scenarios. Belayers may need to insert their own bodies into the system, using stance to supplement the anchor, relying on the anchor as a backup only. Moreover, there is such a thing as a no-win scenario in climbing and in anchoring, when the available resources, the working skill set, or various dire circumstances will not allow an appropriate anchor to be built. When faced with this scenario, a tactical retreat, a call for assistance, or the aid of another climber is preferable to settling for anchors that may well result in catastrophic failure. Is the anchor strong enough? Is the anchor secure enough? Is the anchor as simple as it can be? This is a broader, more inclusive way to think about anchors than the SERENE-style mnemonic. Call it the Triple S approach. Triple S anchors do not strive to equalize or to eliminate extensions; they strive to distribute load intelligently, minimize extensions, and avoid edge-case failure scenarios. Triple S anchors do not attempt to aggregate strength; they rely on unquestionably strong component parts and anticipate a human factor in that calculation. Triple S anchors do not muddle into unnecessary complexity; they solve the anchoring problem as efficiently as possible. Strength. An anchor must be adequately strong to sustain all potential loads ap- plied to it. Then, an anchor’s strength must be padded with a margin of error that could account for any number of mistakes that all humans are wont to make. Let’s be conservative and provide ourselves with a 100 percent margin of error. That would mean that any anchor should be strong enough to sustain all potential loads applied to it multiplied by two. Security. This means that if anything unexpected happens—components fail, the direction of load changes—the anchor must survive those unexpected changes. An anchor that is secure has backups. It has systemic redundancy all the way to the masterpoint. If any single point in the anchor were to fail, other points would pro- vide adequate backups. We make a few exceptions for anchors that are so titanic in nature (large, stable trees and boulders) that we might rely upon these single features alone, but even these features could be rigged in a redundant fashion. Simplicity. A climber needs to appreciate that any anchor can quickly become convoluted and overly complex if it is rigged to solve phantom hazards or improb- able contingencies, or if it slavishly adheres to anchoring principles that are unachievable. For any given anchor, simplicity refers to the overall amount of time to construct and deconstruct an anchor. Simplicity refers to the overall amount of equipment needed, including rope, slings, carabiners, and any amount of pad- ding or edge protection. All this should be minimized. Simplicity also refers to the number of knots being tied and untied, the number of steps needed to construct the anchor, and the distance the components are separated. All these should be minimized too. When time, equipment, and number of steps are all minimized, and an anchor still demonstrates adequate strength and security, an anchor will have achieved the best end result our current knowledge and technology can offer. These statements and the reductive thinking behind them have inhibited Assisted Braking Devices from taking their logical place in American climbing. This article will seek to unpack and explain some of the historical and cultural underpinnings of assisted braking devices like the GriGri in order to explore how these devices have gotten to the point that they are neither appreciated for their contributions to climbing nor adequately respected for their complexity and intricacy. To get there, we will need to clarify the current and historic role of backups in any technical system related to climbing. We will need to explain how these tactics long preceded the invention of the GriGri, because they are still just as important in the era of assisted braking devices as they were before GriGris hit the scene in the early ’90s. Then, every climber will be better equipped to discover what Assisted Braking Devices offer to the overall security of a belay or rappelling system. Assisted Braking Devices, when used correctly, provide a reliable backup to any belayer. Assisted Braking Devices, when used correctly, offer the greatest movement economy when delivering slack to a lead climber. Unlike Manual Braking Devices (like any tube style device), ABDs have widely variable performance characteristics from one model to the next. In climbing, we use backups all the time. We use them as an integral part of our systems and we often use words like redundancy and security when we’re talking about backups. In every case, the basic concept is the same: a climber relies on one system to stay safe, and there is another system that acts as a back-up in case the primary system fails or malfunctions. Backups are a great idea, and they help us have a lot more confidence that we’re going to survive an error, a slip, an oversight, or a freak occurrence. When we choose not to use a backup, we’re often flirting with unnecessary risks. It is not common to think of backups in this way. However, when a climber analyzes the role of backups and looks at all climbing practices through that lens, it is difficult to escape the conclusion that holding a climber’s weight with a manual braking device and lowering a climber with that same device is tantamount to free-soloing. Unlike free-soloing, though, belaying usually involves two people; they are both complicit in this arrangement. Before Assisted Braking Devices were an option, conservative belay teams relied on backups that are still options today. Since climbers are often standing around in groups of three or four, it's easy to offer a backup belay. If a backup belayer is not standing behind the belay device, in the braking plane of the device, the value of the backup might be nominal. These backup knots, tied every 10 to 15 feet, provide a backup to the belayer when she does not have someone available to provide a backup belay. While a friction hitch can provide an adequate backup for lowering, it takes practice to tie this hitch while holding a climber, and it won't work on every harness' leg loop design. A careful observer of these traditional forms of backup will notice that an incompetent belayer (or pair of belayers) still has the capacity to injure a climber. So, an unstated but obvious addendum to the application of any backup to any system is that incompetence is presumed to be negated. It’s an important distinction to make. Gross incompetence can override all reasonable backup systems, and safeguarding against incompetence quickly becomes impracticable. Belaying systems presume functional cooperative competence as a starting point, and backups safeguard unforeseen forces and circumstances that can unexpectedly incapacitate a belayer. So, it’s important to combine fundamental belay principles to any belay device, regardless of the braking apparatus. All devices require a belayer to keep a brake hand on at all times, slide or alternate the brake hand only when the rope is in the braking plane of the device, and use the hand wrist and arms according to their natural strength. An assisted braking device, operated within the fundamental principles of belaying, is an especially valuable tool if climbing teams prioritize backups. If a belayer takes an honest self-assessment of all the things that might thwart the best intentions of a diligent and competent belay, then it is difficult to justify not prioritizing backups. It is perfectly reasonable, and perfectly human, to accept that any number of sights, sounds, and distractions compete for a belayer’s attention. Other climbers, friends and acquaintances, passersby, flora and fauna, changes in weather, they all distract even the most committed belayers. In these perfectly predictable and likely circumstances, the assisted braking mechanism of an ABD can provide the ready-to-go attentiveness that the belayer momentarily lacks. Accident archives and anecdotal evidence demonstrate, again and again, that the selection of an ABD provides belayers and climbers with a backup should any of the aforementioned hazards incapacitate the belayer. On one notable example, a pair of proficient climbers had a spectacularly close call in Eldorado Canyon in 2008. In much the same manner catalogued above, the leader climber dislodged a large rock during a lead fall. That rock fell and hit the belayer. The belayer, having selected an ABD, managed to arrest the leader’s fall despite the severe injuries he sustained. Had the belayer selected a manual breaking device instead, like an ATC, without any sort of backup, the leader would have likely been severely injured as well. As it turned out, the leader was able to run for help and assist rescuers to evacuate his partner. An ABD is not a panacea for mishap or incident, but it does provide all belay teams, like this team from Eldorado Canyon, with a margin of error. Surely, that’s an adequate incentive for any climbing team to learn more about ABDs, and it’s a sound reason to learn to use them correctly. Many assisted braking devices offer the greatest economy of movement when delivering slack to the lead climber. Even though many belayers assert that ABDs have cumbersome mechanics resulting in a jammed rope and an inability to provide adequate slack, most of these assertions are based on a lack familiarity with the techniques needed to use an ABD to belay a lead climber. The key to this movement economy involves a stationary brake hand. It might be helpful to see fundamental belaying with an MBD contrasted with an ABD to demonstrate this concept explicitly. Many ABDs, by contrast, keep the brake hand stationary, eliminating an entire step in the belay cycle. As result, there can be a 50% increase in overall efficiency when the belayer delivers slack to the leader. This movement economy is especially useful on easy or moderate terrain, when the leader is unlikely to fall. One of the greatest hazards to the leader in that terrain might be getting tripped or snagged by an inadequate supply of slack from the belayer. An imperative to provide adequate slack is also common on low-angled terrain when the leader tends to move in long strides. That kind of movement necessitates adequate slack because the leader’s balance is often precarious and unstable. In any case, it may be valuable for a belayer to opt for a belay tool and technique that provides slack to the leader as efficiently as possible while also adhering to the fundamental principles of belaying. While the Petzl GriGri tends to represent the entire genre of ABDs due to its popularity and history, it is not the only ABD available. A careful analysis of the various functions, applications, and performance characteristics of each ABD should help belayers make an informed choice when they select a device. ABDs are typically deployed in the following contexts, although many of these applications are not necessarily recommended by the manufacturer. Manufacturers tend to create recommended use guidelines that pertain to the most common usage, and any application outside of that usage is implicitly discouraged. Nevertheless, many climbers rely on these kinds of applications, so it will be important to disclose the nature of each application, even though the manufacturers may not. These applications will be listed from most to least common. An ABD’s ability to perform these applications and functions help climbers decide when and how to use one tool or another. 1. Belaying a counterweighted toprope. In a toproping scenario, ABDs are commonly deployed by institutional programs, climbing gyms, and professional climbing instructors. The values of an ABD as a backup are especially conspicuous to these users. 2. Belaying a leader in a counterweight arrangement. The belayer’s body weight anchors a leader’s ascent in protection increments. Sometimes this arrangement is distorted by the use of a ground anchor or a connection that protects the belayer from an upward pull. An ABD can predictably increase the impact forces generated by lead falls. Impact forces are measurably increased on the belayer’s body, the climber’s body, and the protection/anchor. In most scenarios lead climbing scenarios, however, the differences in impact force would not have catastrophic consequences. 3. Rappelling. If a rope is somehow fixed or counterweighted, an ABD can be used as rappel tool on a single strand of rope. When a single strand of rope is fixed, blocked, or counterweighted, an ABD can be used for rappelling. 4. Rope Ascension. If a rope is somehow fixed or counterweighted, an ABD can be used as a progress capture in an ascension system. Many climbing instructors, like this one, learn to use an ABD for rope ascension. As an improvised progress capture, these tools can be effective. 5. Direct Belay. ABDs are often used by belayers to top-belay a second climber directly off the anchor. When top-belaying, direct belays are particularly advantageous. ABDs create unique challenges when belaying a leader in direct belay configurations. Direct belay applications must allow an ABD a full and uninterrupted range of motion. If the device is laying on a slab or crammed against a protruding feature, the assisted braking function can be compromised. ABD manufacturers will each try to convince consumers that their products represent the most secure, reliable, easy-to-use device on the market. The truth is that climbing has diverse contexts with diverse environments, climates, and risks. That diversity is further compounded by the number people who climb: big people, small people, big hands, small hands, right-handed people, and left-handed. Some people are missing digits or limbs, and that might make one product more advantageous than the next. When combined with function and the need for multi-functionality, each device will also have an array of performance characteristics that depend on each individual user’s style, body type, and unique challenges. Asking the following questions of every ABD will guide a user to the right model. Stationary Brake Hand: Does the manufacturer recommend a belay technique that allows the brake hand to remain stationary? Many devices do allow for this movement economy, and it is one of the most persuasive reasons to select an ABD in the first place. Mechanical Braking or Passive Braking: Is the assisted braking function mechanical or passive? Mechanical Assisted Braking Devices, like the GriGri 2 or Vergo, have moving cams, clamps or swivels that pin the brake strand of the rope. They are typically bigger and heavier than their passive counterparts. Their performance can be challenged in wet, snowy, or icy conditions. They can provide smooth lowers, multi-functionality, and reliable braking, though. Passive Assisted Braking Devices exaggerate the “grapping” quality of any aperture or tube style belay device. The “grabbing” effect is so severe, it effectively brakes the rope, providing the belayer with a backup. Ergonomics: Does the recommended use of the tool force the belayer to sustain unnatural, painful, or uncomfortable body positions? Test the ergonomics of a device in all the application contexts. For example, the body mechanics involved in using a GriGri 2 are quite natural and comfortable for rappelling and counterweight belaying. 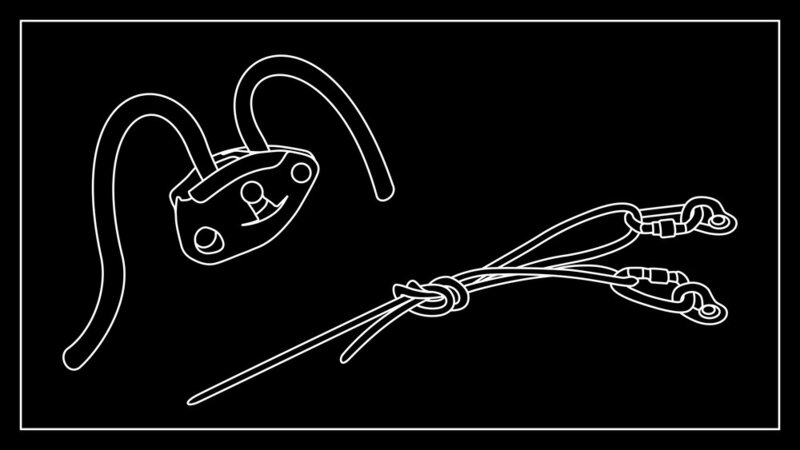 But, lowering with a GriGri in a direct belay configuration requires an awkward manipulation of the GriGri 2 handle. Reliability of Assisted Braking Function: Does the Assisted Braking Function perform reliably in the widest range of conditions and circumstances? What are the known malfunction conditions? No ABD is automatic and 100% reliable. They all have quirky and unique failure mechanisms that range from interference in the braking function’s range of motion, interference caused by precipitation (frozen or otherwise), inappropriate carabiner selection, or rope entrapment. Manufacturers don’t always advertise these failure mechanisms. Multi-functionality: Does the device perform more than one function in climbing? Do all the functions of the tool fall under the device's recommended use? Are some functions discouraged, or are they simple NOT encouraged? Smooth lowering and rappelling: When lowering and rappelling, is the belayer able to control the rate of descent and keep that rate constant, without sudden halts or acceleration? The ability to adjust the rate and the consistency of the rate varies from one tool to the next, and it can be especially inconsistent when using ropes at the extreme ends of the recommended range, ropes that are wet, or with smaller statured people. Ambidextrous Usage: Is the device effectively unusable by a right or left-handed belayer? Does it function equally well with either handedness? Many devices do not offer a compelling left-handed technique. Left-handed belayers often learn to use their right hands to belay because there is not a recommended technique, or the recommended technique is not as effective as simply learning the right-handed technique. Size and Weight: How big and how heavy is the tool? Are there lighter options that accomplish the same functions and have the same performance characteristics otherwise? In climbing, the size and weight of equipment can often make a big difference to the overall enjoyment and success of the team. All other things being equal, why not have a lighter, more compact tool? Rope twisting: Does the device alter the plane of the rope’s travel? When ropes move continuously in the same plane of travel, the rope is less likely to twist. When that plane alters, say from a horizontal to vertical plane, twisting the rope is the unavoidable consequence. Easy to learn, easy to teach: How long will it take me to learn to use the tool? Devices that are not ergonomic, have intricate parts and setups, and operate differently than other tools can often be more difficult for a belayer to learn to use correctly. It shouldn’t take months and months of practice to learn to use a piece of belay hardware. The masterpoint of an anchor is aptly named. It is designed to be the working focal point for anchoring, belaying, and a number of auxiliary tasks that might happen while rock climbing. Much like the Master Bedroom of a house, the masterpoint is where the residents of the anchor want to be. The Masterpoint offers the most capacious, the most secure, and the most versatile operational/organizational platform available. Recognizing and utilizing a masterpoint is often so routine for practiced climbers, it is hard to imagine connecting to an anchor in any other way. However, alternative connection options (like the anchor shelf or components) often bewilder and confuse newer climbers. Without clear direction one way or the other, it is easy to imagine an uninformed anchor resident choosing to reside in the broom closet rather than the master bedroom. In these sections and illustrations, we will explore why the master point is the MASTER point, variations on what a masterpoint can look like, and why and how the anchor shelf and components can be valuable connections too. Lastly, we'll examine some special cases anchors which may lack a shelf, or in some cases the actual location of the shelf might be confusing. The Ponytail Anchor is common. Using a 4’ Nylon sling it creates all the values climbers have come to expect from an anchor. It is redundant, it distributes load evenly to the components, it is strong, and it is easy to build and take apart. The Masterpoint is where all those values come together. Similarly, a simple ponytail anchor with a cordellette provides a masterpoint with the effective strength of four strands of 7mm nylon cord. The three piece anchor that is so common in trad climbing also provides a working masterpoint. Here, a 7mm nylon cord effectively produces a 21mm masterpoint and combines all the values needed for an effective anchor: strength, redundancy, load distribution, and simplicity. An 11mm static rope can be used to combine components in the terrain that may be far apart from each other. Once tied off, the anchor builder has to select a knot that combines the strength of the components, and retains all the values of an effective anchor. Here, a BHK is an ideal choice. It creates a redundant masterpoint. The quad is a self-adjusting anchor system, and it is commonly applied to anchors where the direction of load changes direction. The effective masterpoint uses three of the four strands in the nadir of anchors arc. The fourth strand captures any carabiners or connections if one of the components were to fail.